While making my card ships I was set to thinking about the realities of combat between these kinds of ships. I sail with 25-metre viking ships - these are effectively monokrotic pentekonters- and , even without tiered oar positions I would not like to leap at another similar ship with defenders waiting. In armour and with a shield the process of negotiating 'the gap' is a tricky one. Add the movement of the ships and whizzing arrows to produce a nasty situation. If the ships have no railings such as Olympias is today, then an athletic young warrior could leap from deck to deck, his reception notwithstanding. However, it would appear that the usual state for a warship in combat was to have railings and even a line of shields mounted on it too. This means the process of climbing off one's own ship and onto the other is much more difficult.So much so that I begin to think that it was rarely on the cards. In a battle based upon ramming, the ships usually come into contact with one prow against another part of the opposing ship or two prows meeting. Here there is a bottleneck which is difficult to pass. Little chance of either side getting onto the other. Within seconds or minutes the two ships would be separated again. One would imagine that ships locked together after collision or press of battle would be more vulnerable to enemy clambering onboard. However. usually the distance between ships was not negligible. The ram held the target ship at a distance. Oars, even broken, would hold the enemy ship away so it could not lie immediately alongside. Here is one way the oarsmen could contribute to a fight - by holding the opposing ship off with their oars. 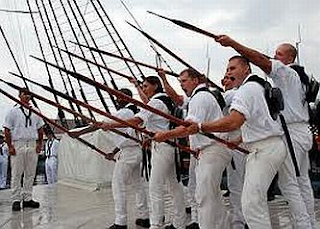 The sailors were divided into two teams to mange th efore and aft-ship , Polybius says they had poles/boathooks with which they could fend off other ships to avoid collisions. The usual case would require a leap to gain the other ship. 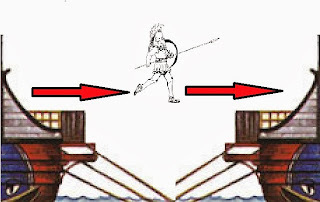 The paraxeiresia / outrigger would be another gap to be crossed - Brasidas fell into the outrigger during fighting at Pylos (also an example that shows a trierarch probably wore military gear). 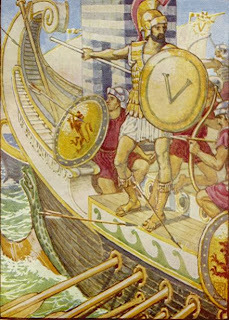 Brasidas stands on the outrigger he should fall through (because it should not be boxed-in), on a Roman ship from 300 years later. But he cuts a fine figure anyway. Shipboard combat did not have space for phalanxes, files and ranks. It was a case of individual prowess and small group cooperation. This also argues against offensive boarding as a common tactic amongst Greek ships with 10 hoplites and 4 archers onboard. 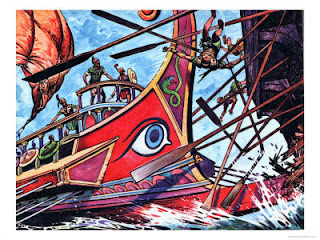 The few who clambered aboard the opponent would be met by the enemy with their 14 fighters plus armed sailors and oarsmen. It must have been an exceptional circumstance for a bridgehead to be won in these circumstances. The corvus was an interesting innovation, not only because it locked the target ship onto the attacker but also because it provided a funnel to pour deck troops onto the enemy ship so that a more regular combat could take place. 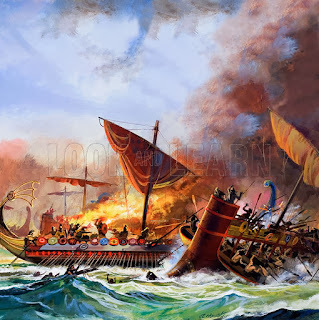 Its genius is that it solves the two main problems with getting a good solid melee going at sea (which the Romans thought they would usually win) - First problem was to have a solid hold on the enemy ship and the second was to provide a secure footing for attacking marines. 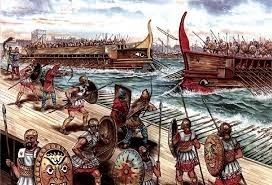 The Persians had circa 40 deck troops on their ships at Salamis according to Herodotos. Many writers assume this is a loading of the ship with marines a la the Roman tactic. But there was no equivalent of the corvus, no mention of gangplanks, even (though a trireme should carry two boarding ladders - for crew embarkation). We also know that the Persian style of fighting called for maximum use of the bow and then a short spear when things got to close quarters. 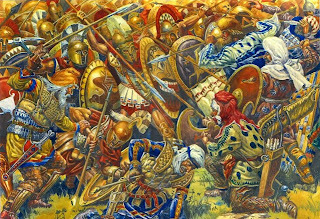 The Greeks were contemptuous of their poor armour and shields. The fighting at Platea illustrates this, where the Persians were admired for their courage but almost pitied for their lack of skill and coordination. Nice clothes shame about the relatively low combat efficiency against western heavy infantry. This large number of troops was most probably expected to fight as they usually did, to shoot with their bows. In this way they could damage the enemy and make any boarding attempt very costly. 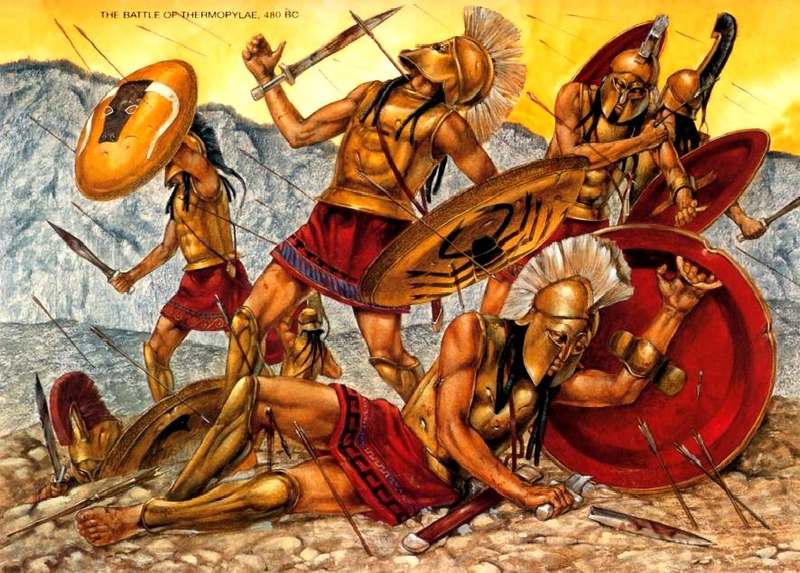 Not long before, the last stand of the defenders of thermopylae was reduced with massed archery. Archery should be effective at sea where ships manouvre at a distance and accurate shooting at 100m or less would be potent. A hoplite, with his large shield crouching on a deck of a moving ship was, however, no easy target. In addition, if the Persian ships had a high side as many suggest with reference to the Sennacherib reliefs, then clambering over them to board anenemy made things even more difficult. Why bother ? Just shoot his deck troops and commanders down then waltz over afterwards. Diodoros - at a later date - tells of javelins and special long spears being used at distance and then swords when the combatants were at each others' throats. Such fighting as took place must have been first and foremost around the forecastles of ramming ships with poor chances for the defender to get onto their tormenter before he backed-off. Any ship using its ram effectively would not be trying to board the other. Ram and sink was better than getting involved in boarding actions. Deck fighting would result from entangled ships and ships held together long enough - and held CLOSE enough - for such fighting to develop by whatever means. The time available after impact and before the rammer backed away was short - the boarders must be well prepared and very aggressive in their actions, not to mention nimble. How NOT to greet an oncoming rammer : I hope they can swim. 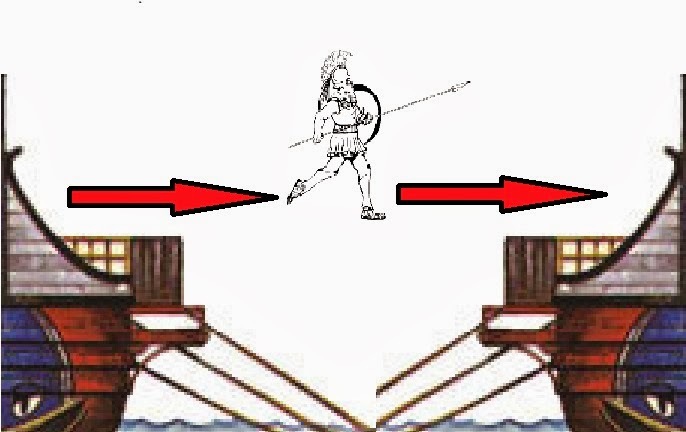 The ramming impact could cause a ship to lurch sideways and to roll violently - the deck troops on the target ship must hold on to avoid being thrown about. They could not stand waiting for the impact ready to simply hop onto the enemy ship. Grappling hooks are little heard of in Herodotos and Thucydides and then mostly in connection with dragging captured or sunk ships away. A ramming ship would by definition not use grapples - no point in holding on to a damaged enemy. A target ship may want to grapple but to organise it when the best option may be just to let the attacker back off and leave makes it doubtful. Grapplers would be sinking ships seeking to be bouyed-up and ships intending to take a crippled opponent as a prize. The idea that two fresh fighting ships with rams would be simultaneously trying to board each other is not logical. In specific circumstances we do read of ships loaded with troops intending to fight it out hand-to-hand but these are mostly larger ships from a later age. The 3 was a mobile ram, not a troop-carrier. As an aside, the Osprey illustration of a 'grappler' working from within the oarsmen's space does not allow for the closeness of the oarsmens positions nor the chaos he could cause by being there. He would stop at least 2 and maybe 6 men using their oars. 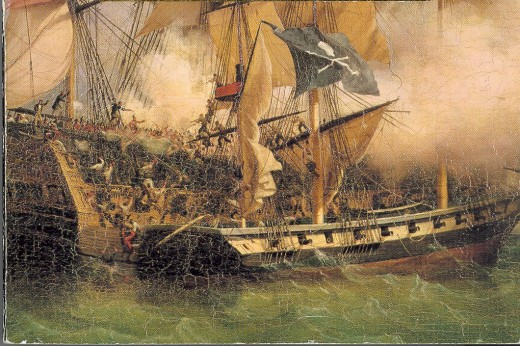 An attack with the intention from the outset to grapple and capture the enemy ship is more likely to be conducted like a classic pirate ship action from Hollywood, with ships lying abeam. With the ship approaching the target to lie parallel gunwale to gunwale so its own marines can together jump over to the target ship. Osprey eat your hearts out..
Tri Tri and Tri again..